Beginning genealogists often make the mistake of plugging the names of their ancestors into online databases, looking for any type of results they can get quickly, with the minimum amount of effort. While this "dartboard approach" to family history may provide some initial instant gratification, it isn't the most beneficial method of success for your genealogical "long haul." You can also spend hours, weeks, or even years following leads to documents that don't hold much of the key data you seek--the names, dates, and places that can successfully get you back to the previous generations. I like to call this the "good stuff." Here are five ways to locate the richest genealogical resources. A general guideline for beginning your genealogy is to "start at home." After all, what could be better than viewing an ancestor's original baptismal certificate, passport, or military discharge notice? Ask all of your living family members whether they have any paperwork or photographs. Don't just ask your immediate family. Reach out to aunts, uncles, cousins, and anyone else who may be able to help you. Of course, acquiring such precious family documents may not be possible, especially if the older generations have passed away, or for whatever reason, they were not particularly forthcoming with information. If this happens, try employing the technique of "reverse genealogy"--working forward in time to find the living. Try searching for surnames and places on Google, share your family tree online, or use social media. Perhaps you'll connect with a long lost relative, or someone who has some hidden genealogical gems (a bible, diary, letters, etc.) tucked safely away in a box in their closet or desk drawer that may contain those missing clues! For more tips, read, "Reversing Gears: How To Find Living Relatives." In genealogy, not all records are created equal. A primary source a record that was created at the time of a event by a person who had reasonably close knowledge of the event. A secondary source is a record that was created a significant amount of time after an event occurred or by a person who was not present at the event. This doesn't mean you should ignore secondary ones, because many sources in genealogy can serve as both primary and secondary sources. For example, a marriage certificate would be a primary source for a marriage date, and name of spouse, because it is created at the time of the marriage, but it would be a secondary source for a date of birth, which you could use to order a birth certificate. It's worth the extra time and effort to track down a document that was actually created in the presence of the person you're seeking because there is a greater chance of accuracy for the information. (Note of caution: always evaluate the evidence because even official records can contain errors.) Consult the Board for Certification of Genealogists' newsletter article "Skillbuilding: Guidelines for Evaluating Genealogical Evidence," by Linda Woodward Geiger, for further information. data that can lead you to a better source. 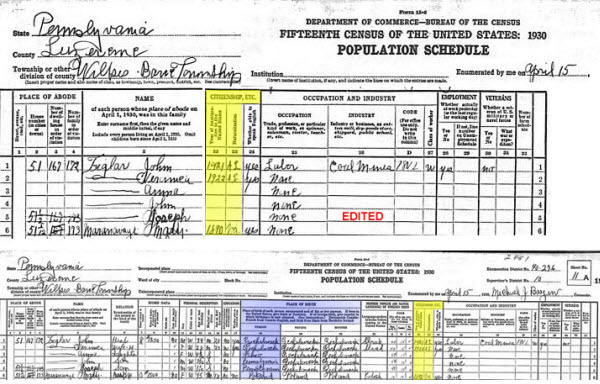 For example, civil death records may have "unknown" for the priest, or rabbi. In other instances, you may find your ancestor in the 1930 Census, but his place of birth may only be listed as "Austria." This is not especially helpful since you will need to know the name of the specific town or village where he was born in order to track down a birth or baptismal certificate in the old country. However, certain questions asked in the Census may provides clues you can use to find missing details. Check CensusFinder.com for a list of questions asked on each U.S. Census. For example, you may want to look at the column with the question "What year did this person immigrate to the US?" for a date that you can plug into immigration databases to locate his passenger list or arrival record (later records usually list a more specific place), or if there is a notation in the "Naturalization" column to indicate your ancestor went through the naturalization process, you can look for his or her Declaration of Intent (also called "first papers"), and Petition for Admission to U.S. Citizenship. Depending on the time period, one or both of these documents may list the name of the ancestral town/village (papers filed later than 1900 are more likely to contain this information than those processed earlier). Learn how to evaluate each type of record you discover, extracting the most useful items that may lead you to even better information. During the course of your research, perhaps a family member told you "there are no living relatives left," or you've heard, "all those records were destroyed," or other similar statements. The first reaction may be to dismiss a particular source, or just accept what someone else has told you and not bother. But, giving up so easily won't get you anywhere. Certainly, wars, natural disasters, or human error destroyed records, but in some instances you may discover that copies of government-mandated records were often sent to central or regional archives, or other repositories. There are always exceptions to what you "believe to be true" and success depends on many factors: who you're researching, when and where an ancestor lived, how a person is listed (under what name and how accurately they are documented,), and other external factors which may have influenced record keeping or retention. Click here for additional tips on finding "lost" ancestors. When trying to attack those brick walls, persistence can really pay off. Family history research is often compared to a treasure hunt. You're on a quest to find the genealogical gems and the golden nuggets. But, remember: You may have to dig through a lot of dirt before you can find something of value.